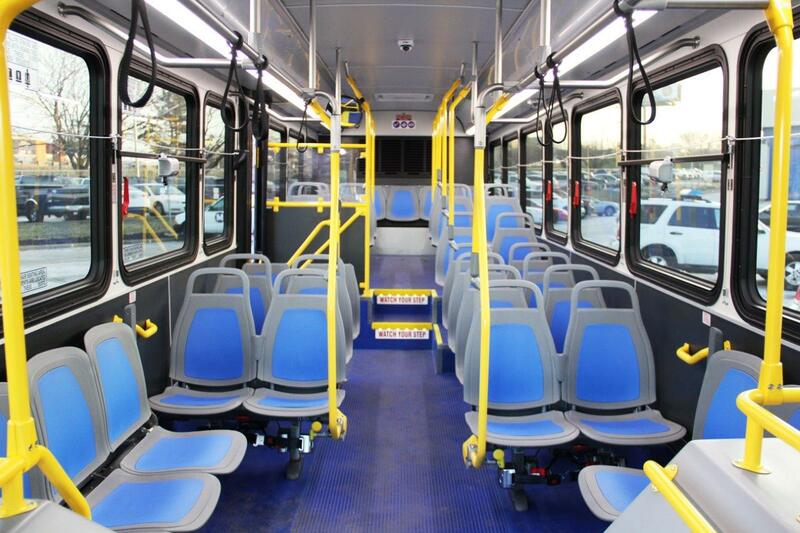 New buses are joining the MetroBus fleet, and soon you’ll have the opportunity to step inside and see what’s new. When you board one of the 30 new Gillig buses, you’ll notice a few distinctive features right off the bat. First, we’re introducing new seats from American Seating that are ergonomic, but are also very durable and easy to maintain. The color yellow makes a more prominent splash inside the new buses. Yellow has always been used to emphasize key points of contact inside MetroBus vehicles, and this trend continues with the new buses, where we’ve used it to highlight even more areas to ensure high visibility and safety for passengers. These buses also feature a new protective barrier around the operator’s area, which allows for safe interactions between MetroBus operators and passengers as well as an increased level of protection when needed. Under the hood, the new 40-foot Gillig models have improved braking systems, engines and cooling systems — all to make your commute more comfortable, safe and enjoyable from Point A to Point B. 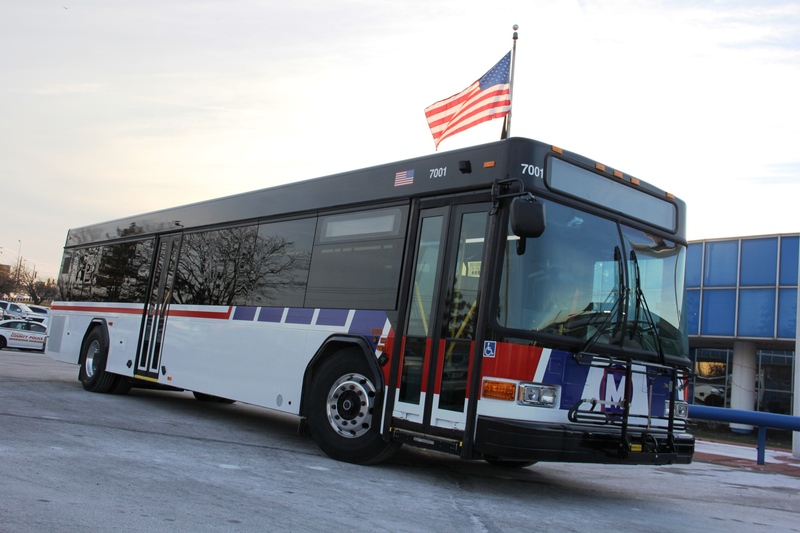 The 30 new MetroBus models will join the rest of the nearly 400-vehicle MetroBus fleet this spring. I love Gillig. I loved them ever since the first day we started buying them. What we really have are the 35 footers. The 30 footers would have seats over the wheel wells. And now for the first time a safety glass attached to the guard. I also liked the Flxibles. The old 7000s thru 7500s were Rhor Flxibles. Those buses not only had blue floors but also the dash was blue, the doors were blue and also the standee window area was blue. I am glad to see blue return to the seats. If we installed Lift-U wheelchair lifts on the Rhor Flxibles, they probably would have been running today. Do they display the route number on the back? Ren, these versions display the route name and number on the side of the bus and on the front head sign. Route numbers on the backs of buses just tell you if you should run to catch it or not. If you do run, the chances that the bus will pull off before you get to the front door are 9 in 10, so why bother running in the first place? I also felt that bus seats were not suited for folks who were below the average height. Is that still the case? Are the seats in these new gillig buses any lower than the existing ones? Aligo, sorry about the delay, we’ll go ahead and measure the height of several bus seats for a definite answer, but according to the bus specs the seat height is 17 in., ± 1 in. for the rear lounge (or settee) and longitudinal seats. Seats located above raised areas for storage of under-floor components, have a cushion height of up to 18 in., ±2 in. Aligo, as a follow up, we did find the seats on the newer buses are about an inch lower than what is currently installed on the low-floor buses. We are currently in talks with the seat manufacturer. Nice buses ,keep them coming ,just a small thought ,in the future Wi-Fi for the transits centers ,and I know that the regularities’ are for safety and it is important for us to say in formed ,Just a small concern .I ride a lot and I am a vendor ,and staff .Thank you ! Stephanie, that’s a great idea about the Wi-Fi at transit centers. We’ll make sure we send your recommendation to the appropriate team members for review. If you haven’t checked out the North County Transit Center yet, I highly recommend a visit. Going forward, this is how transit centers will be built. They will include public restrooms; an indoor, climate-controlled waiting area; 24/7 security; digital arrival time display boards; a free Park-Ride lot; and a cafe. You’ll see these enhancements in downtown St. Louis when the Civic Center Transit Center reopens later this year! Thank you it is really nice and comfortable and the Cafe is cool ! I really like these new buses. They seeem to stay at a much cooler tempeture and on routes such as grand and rock rd which can be packed to standing room only, this is a nice feature.